This Peru journey takes you beyond the conventional to explore new territories. Set sail with Jean Michael Cousteau and his team to experience the Amazon from the perspective of a conservationist: discover this fascinating destination as you learn about the challenges we face to preserve wildlife habitats, delicate ecosystems and evolving cultural traditions and economic pressures which threaten the environment. From this natural viewpoint, you clearly see the road entrance to the Colca Valley and the confluence of the rivers. With a depth of 3,270 m/10,725 ft, Colca Canyon is one of the deepest in the world, and more than twice as deep as the Grand Canyon in the United States. Transfer to the airport for your flight to Arequipa, and check in to your hotel. 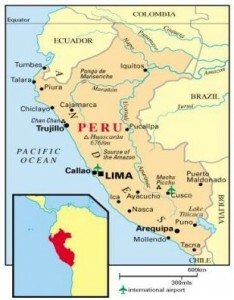 This is the most beautiful colonial city in Peru and the second largest. Known as the White City for the white stones used in buildings, Arequipa sits in southern Peru at an elevation of approximately 2,286 meters/7,500 feet and is surrounded by the towering peaks of El Misti, Chachani and Picchu Picchu. Note: trekking experiences in this itinerary are done at high altitudes and participants should be in excellent physical condition. This morning, you have the opportunity to go sailing on Lake Titicaca, the world’s highest navigable lake. You learn about the ecology of the lake, including the Titicaca water frog, an endemic, very large and critically endangered species of frog in the family Telmatobiidae. It is aquatic and found only in the lake and rivers that flow into it. Jacques Cousteau first made known the Giant Frog in the 1970s. Cousteau came to film one of these frogs that measured 50 centimeters, nearly 20 inches. The frog is valuable for the ecological balance of Lake Titicaca. This morning, you are transferred to Juliaca Airport to board your flight to Lima, where you will connect with your flight to Iquitos. On arrival, the Aqua Expeditions staff welcome you and transfer you to the pier to begin this once-in-a-lifetime journey to the main headwater of the Amazon River in the company of the Jean Michael Cousteau, who led a large-scale scientific exploration of the Amazon from its mouth to its origin. The expedition culminated in a six-hour television documentary titled “Cousteau’s Amazon” released in 1983. It offered study information to last years and gave insights into the biology and geology of the largest river system on earth. Using an international team of twelve and bringing in expeditionary specialists from Germany, France, Argentina, Peru and the USA, Cousteau put together resources and logistics spanning a thousand miles of unknown jungle. From the moment you step on board the Aria Amazon, you will feel the vessel begin to move, signaling the beginning of a grand adventure; a spectacular journey to a place visited by very few of even the most experienced world travelers. Over the next seven days, you will sail along the two largest tributaries of the Peruvian Amazon, the Ucayali and the Marañon, as well as on the mighty Amazon itself, and enjoy evening talks and conversations with Cousteau and his team as you learn about international conservation from a true expert. Enjoy insider access as you get to know Cousteau in the intimacy of a small group of travelers as you share excursions into the Amazon jungle. Grab a bike or a kayak and pedal or paddle beside this fun and entertaining world traveler as he shares moments from his many journeys. The Amazon River originates in streams that run through the Andes Mountains and flows mightily across South America. Considered the longest river on earth, the Amazon runs at least 6,400 kilometers/4,000 miles, carrying with it more water than any other river in the world. It is responsible for about one-fifth of all fresh water that flows into the world’s oceans. This morning, you board a comfortable skiff to sail from the Amazon River to the Yarapa River. Life jackets, ponchos, rubber boots, and fresh water are always available. As you float down the Yarapa, past the occasional fisherman paddling in a canoe, keep your binoculars ready to spot wildlife. The Amazon River has the richest biodiversity of any river in the world. This morning, board the skiffs to explore Ucayali River, a fascinating black water stream, part of the vast Amazon flooded forest within the Pacaya Samiria National Reserve. Your guides talk about the jungle as you explore what scientists call a "gallery forest," because of its dense vegetation that creates a tunnel of leaves. As you continue to explore this type of riparian vegetation, make sure you look up occasionally for parrots, macaws, and fluffy monk saki monkeys. This morning, the Aria Amazon skirts the edge of the vast Pacaya Samiria National Reserve, a flooded forest covering five million acres at the headwaters of the Amazon basin. You will want to rise early to catch this once-in-a-lifetime experience, one of the great spectacles of the Southern Hemisphere – sunrise over the origin of the Amazon River. Here, the junction of two major tributaries, the Ucayali and the Marañon, form one of the greatest waterfalls in the world. Your savor the sounds of bird songs, as you glide in your small boats past large-billed terns, laughing falcons, exotic short-tailed parrot, and dozens of other vibrantly hued birds. Travel by boat to a community located along the Marañon River, where you will meet and interact with local villagers in this remote part of the world to learn about their traditions and folklore. Walk around with our naturalist guides to see how Aqua Expeditions works with these communities to improve their natural resource management. You will also have the opportunity to buy local handicrafts directly from the artisans. Travel along the Marañon River looking for the varied species indigenous of flora and fauna. You reach the community, where you set out on a hike to explore the environment of the river from its birds such as tanagers and orioles to its reptiles and amphibians. Keep an eye out for the beautiful and eye-catching but poisonous frogs along this fascinating trail, as well as trees and medicinal plants. You return via skiff to the Yacapana Islands, passing them by. You will have one last chance to fish for piranhas and other fish. Then you go in search of the world's largest aquatic plant called “Victoria Regia." As the sun goes down, photograph the freshwater Amazon dolphins both gray and pink. Once back on board, the ship will continue its journey downstream, sailing toward Iquitos through the night. Depending on the weather, you may have on one last excursion to the flood zone that borders the city of Iquitos to observe the houses and shops that actually float on the Itaya River for several months of the year. Then visit the traditional market of Bellavista Nanay, bordering the Nanay River, to see products from the Peruvian Amazon including exotic snacks like the Amazon Caterpillar, called "Suri." These caterpillars live in the palm trees and are considered a very appetizing snack, even in the city.